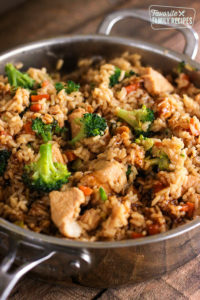 These one pot chicken teriyaki rice bowls make for the EASIEST week-night meal. You throw everything in one pot and let it simmer until finished! In a large, deep skillet, over medium-high heat, cook chicken in 3 Tbsp. Teriyaki sauce until just white on the outside (doesn't need to be cooked through). Add remaining ingredients, except broccoli and extra teriyaki sauce, and bring to a boil. Reduce heat and cover with lid. Simmer for about 20 minutes. Add broccoli, cover again, and simmer an additional 5 minutes or until rice is cooked through. Spoon extra teriyaki sauce, to taste, over the rice and serve immediately.